Short video of diving with the Sevengill Cow Sharks near Cape Town, South Africa. Sevengill Cow Sharks off Miller's Point, near Cape Town South Africa. This image was taken by: Derek Keats. Sketches of the two types of Cow Sharks. The two most popular cow sharks are the Broadnose sevengill - Notorynchus cepedianus (Peron, 1807), and the Bluntnose sixgill - Hexanchus griseus (Bonnaterre, 1788). Cow sharks have a global distribution, from tropical to temperate waters. Sevengills can be found in shallow waters, while Sixgills are generally a deep water species. Sevengills can reach sizes of around 3 m (10 feet), while the Bluntnose sixgill is longer, reaching lengths of 4.82 m (15.8 ft) (Castro, p. 27). The Bluntnose sixgill and Broadnose Sevengills feet on a wide variety of prey, from all sorts of bony fish and other sharks to crustaceans. These sharks are very primitive looking. They only have a single dorsal fin toward the back of their bodies. They are missing the characteristic large dorsal fin that is a distinctive characteristic other sharks. The also have either six or seven gill slits, where all other sharks have five. Their teeth are very odd looking; they are long and comb-like. The Bluntnose sevengill sometimes hunt in packs to capture large prey! 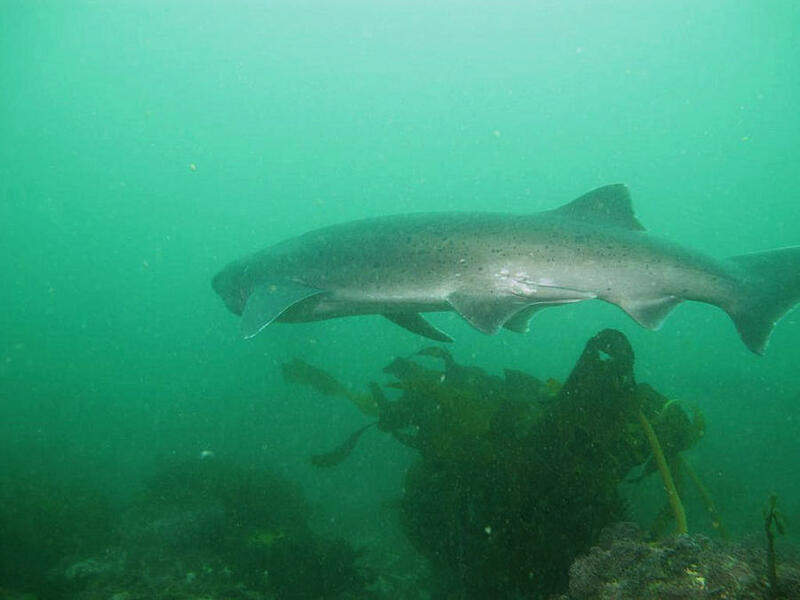 Sevengill Cow Shark off Miller's Point, near Cape Town South Africa. This image was taken by: Derek Keats. 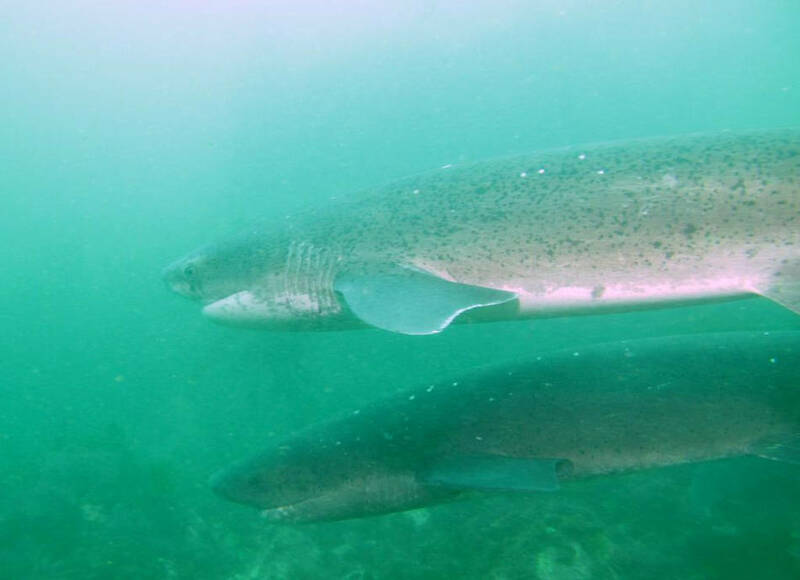 Two Sevengill Cow Sharks off Miller's Point, near Cape Town South Africa. This image was taken by: Derek Keats. Cow sharks first appear in the fossil record in the late Cretaceous as the Hexanchus genus, while the Notorynchus genus first appears in the late Paleocene. They have not changed much in the 60 or so millino years. Today, there are four extant cow sharks. The two most common are N. cepedianus (the Bluntnose sevengill), and H. griseus (the Broadnose sixgill). Cow sharks in general have a characteristic appearance in that they only have a single dorsal fin toward the back of the shark. They are missing the large central dorsal fin that is found on most sharks. They also have very round, blunt snouts. The sixgill sharks have (you guessed it) six gill slits, while the sevengill sharks have (right again) seven gill slits. 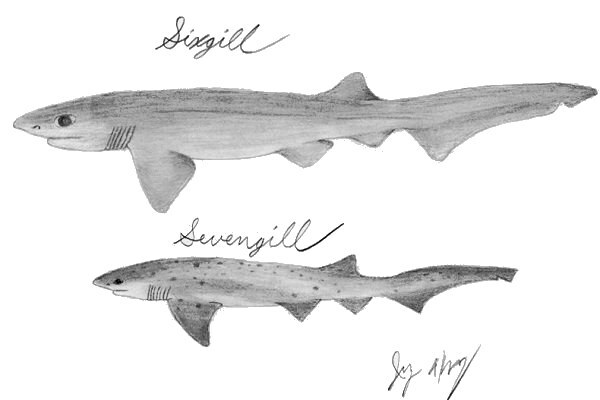 Sixgill sharks are also larger than sevengill sharks. The Broadnose sixgill sharks have been known to reach lengths up to 4.82 m (15.8 ft) (Castro, p. 27), while sevengill sharks have been known to reach lengths of up to 2.64 m (8.7 ft) (Castro, p. 39). 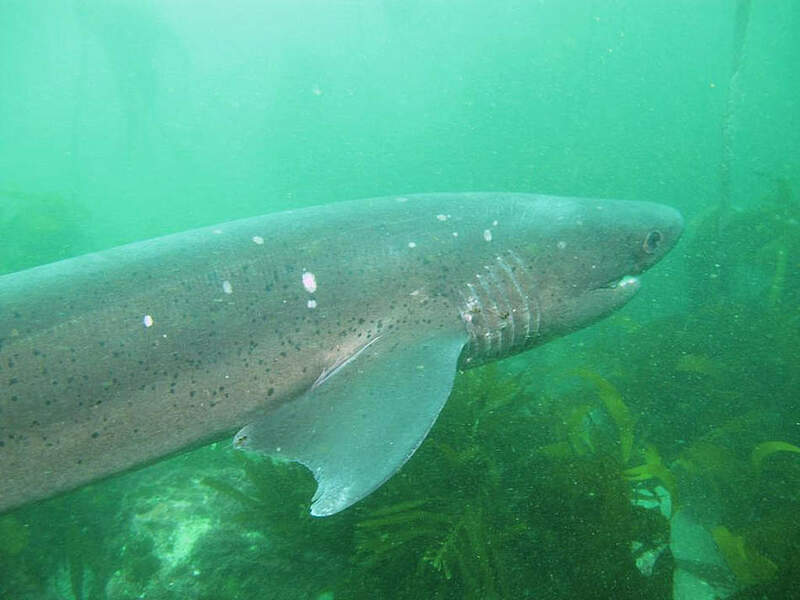 The sixgill shark has a dark gray to brown color, with a lighter underside, while the sevengill shark has numerous small dark spots on the dorsal surface. Although they appear similar, these sharks occupy different ecological niches. The larger Broadnose sixgill shark is primarily a nocturnal deep water shark often reported from depths of 100 - 600 fathoms (1 fathom = 6 ft = 1.8 m) (Castro, p. 27). They have a worldwide distribution in temperate and tropical waters. They feed on crustaceans and a wide array of fishes. The Bluntnose sevengill cow sharks, on the other hand, are aggressive sharks that prefer shallow near shore waters. They are often reported from depths of 3 - 6 fathoms (Castro, p. 39). They are found throughout the Indian and Pacific oceans, and feed on a variety of prey, from fish, including other sharks, to marine mammals. Bluntnose sevengills have also been observed hunting in groups, or packs, to take on larger prey. 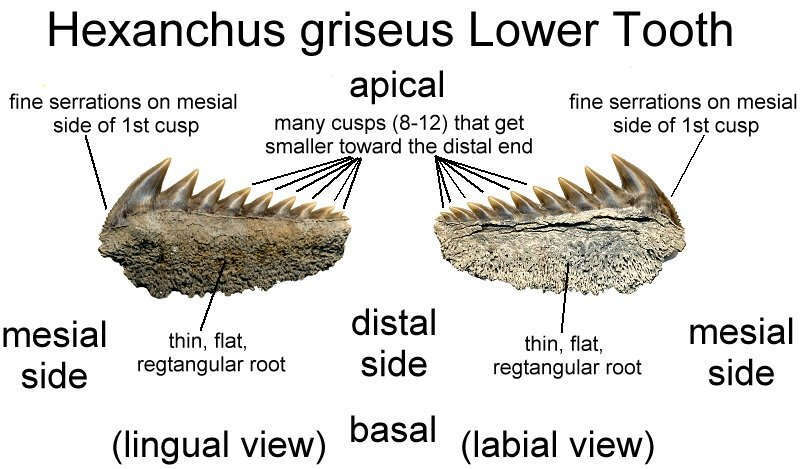 Lower lateral Hexanchus griseus fossil shark tooth identification diagram from Aurora, NC. 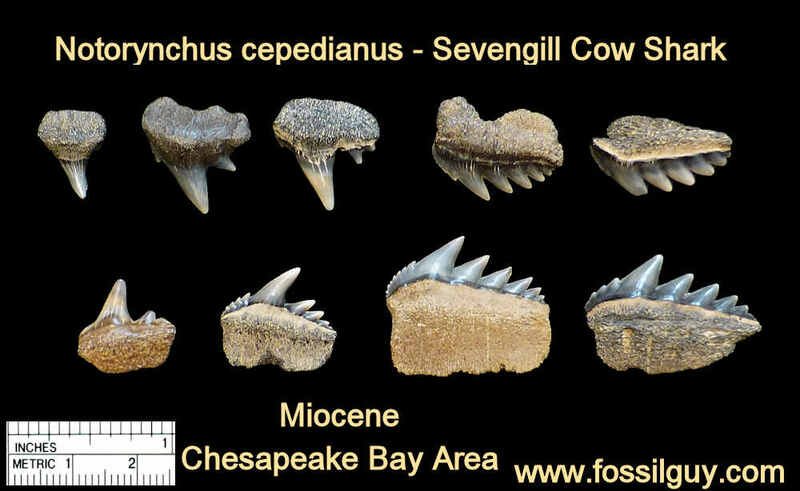 Due to their self-evident shape, fossil Cow shark teeth are nearly impossible to confuse with other shark genera. Lower laterals have a unique rectangular shape lined with cuspls, which become smaller toward the distal end. In front of the first cusp, or primary cusp, on the mesial edge, are serrations. The roots are generally thin and rectangular shaped. Uppers are generally more square-shaped than the lowers, have less cusps, and often lack serrations on the mesial edges. Upper parasymphyseal teeth (front teeth) consist of a single angled cusp and a narrow root. Cow sharks also have a unique lower symphyseal tooth (center tooth). These teeth are fan shaped. Refer to the following image for examples of upper and lower teeth. 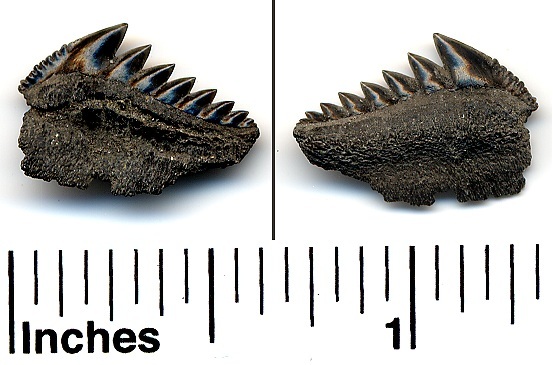 This image shows Notorynchus cepedianus upper and lower fossil shark teeth from the Calvert Cliffs of MD. Notice the lower symphyseal tooth. There are also some differences between male and female teeth. These differences, however, will not be discussed here. 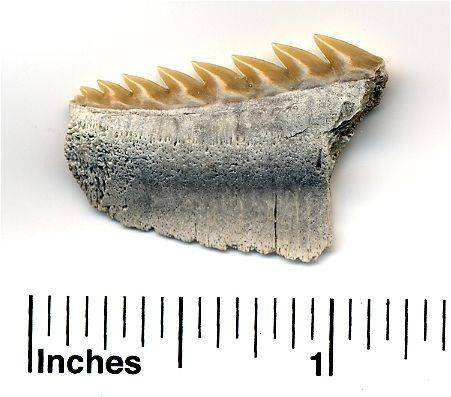 Even though Cow shark teeth are easily differentiated from other shark genera, H. sp. and N. cepedianus can be very difficult to distinguish from each other. There are small differences between the teeth, most of which are beyond the scope of this webpage. However, here are a few general guidelines to follow. To start, H. sp. is a larger, more robust, version of N. cepedianus. The typical size of H. sp is around 32-38 mm (1.25 - 1.5 inches), while N. cepedianus is slightly smaller, around 25 mm (1 inch) (Cocke, p. 82-83). There are two key differences between the two sharks lower lateral teeth. N. cepidianus has less cusps that run behind the primary cusp. Typically there are around 5 or 6 cusps on N. cepedianus, while H. sp. has up to 13 cusps (Kent, p.18). The second difference lies in their mesial edges. H. sp. has very fine serrations on the mesial edge, while N. cepedianus has larger recurved serrations on the mesial edge. A comparison of the shoulders is shown in the image below. 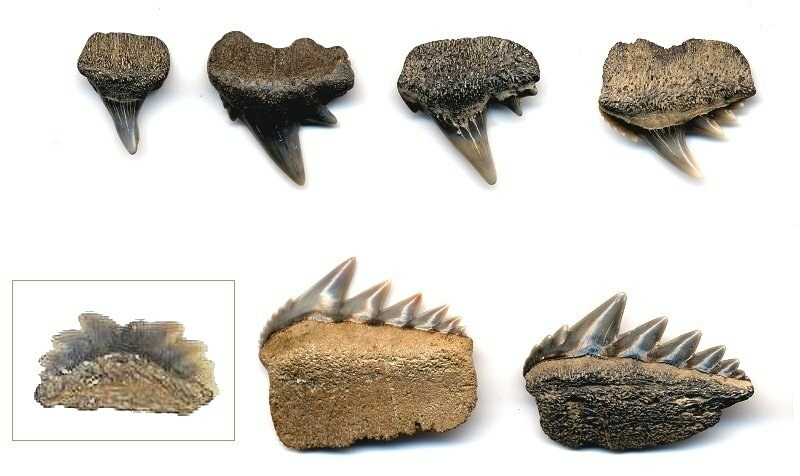 This image shows a comparison between lower lateral Notorynchus and Hexanchus serrations on the mesial edge. Hexanchus has very fine serrations, while Notorynchus generally have larger, curved serrations. 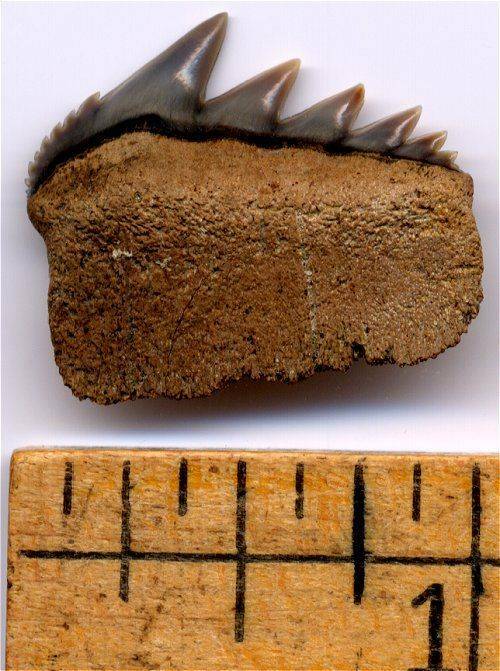 This is one of the main identification differences between the two fossil shark teeth. I would recommend this book to anyone who wants to learn about the incredible diversity of sharks! Places to find them include the Chesapeake Bay Area (Calvert Cliffs Site), North Carolina (Aurora Site), and Florida (Venice Site). 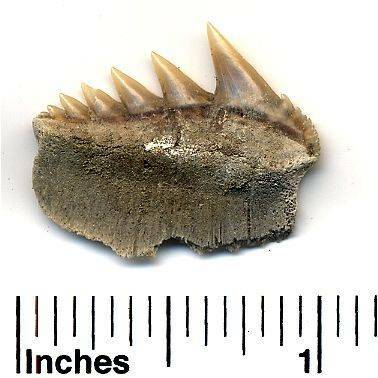 Hexanchus cow shark tooth found at Aurora, NC. 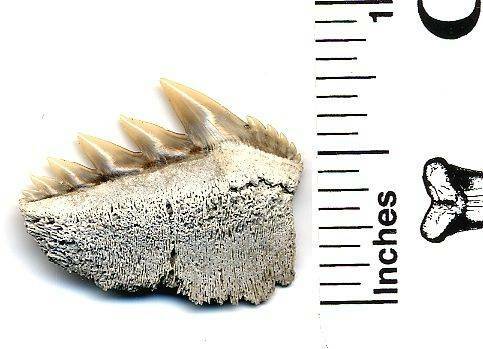 Notorynchus cepedianus cow shark tooth found at Aurora, NC. This is an Eocene species of Cow Shark. These Eocene cow shark teeth use to be called Hexanchus agassizi. These fossil teeth are very fragile and hard to find. This is a lower lateral tooth. Hexanchus collisonae is an Eocene cow shark. H. griseus is a living species today. The fossil teeth are probably from this extant species and first appeared in the miocene. Hexanchus teeth can be easily differentiated from Notorynchus teeth. 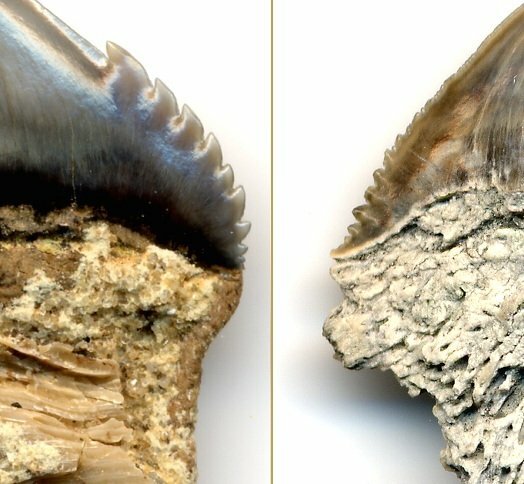 Notorynchus teeth have serrations on their mesial edge, whereas Hexanchus teeth have very fine serrations on the mesial edges. Also Hexanchus teeth tend to have more cones running down the length of the tooth. 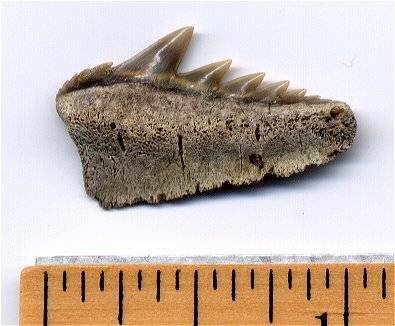 This is an outstanding lower Hexanchus tooth. The teeth of Broadnose sixgill sharks are fragile and are often found broken, like the one in this image. Sadly, the conules are missing on this specimen. 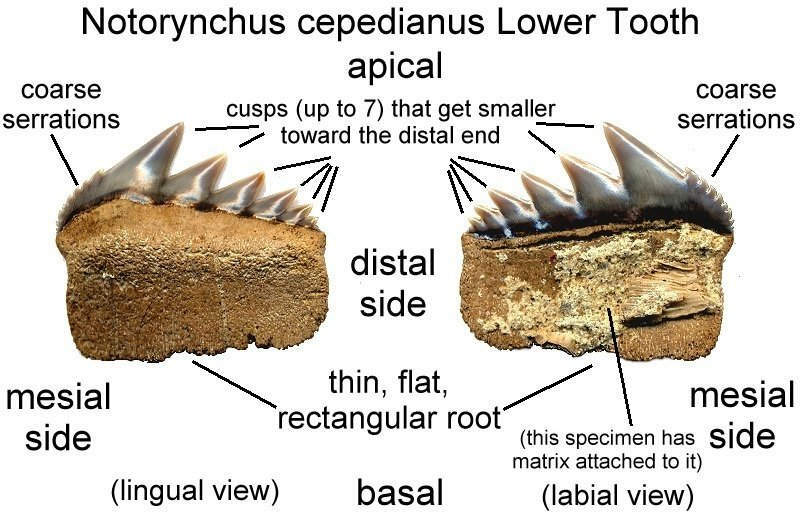 Purdy et al (2001) believe these teeth are identical to the extant N. cepedianus, and therefore N. primigenius is just synonymous to the living N. cepedianus. 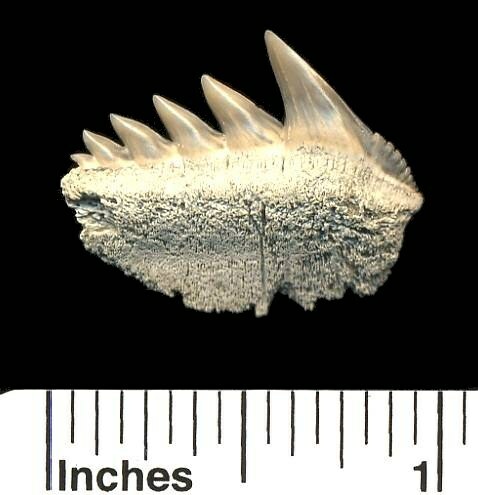 This is my best Notorynchus tooth to date. It is nearly perfect, and was plucked straight from a clay block. Three's more than just teeth!